Dimensionally, this sword is a lot like the Albion Munich (Bayerisches sword.) Since it has a fuller, I would guess it to be lighter (than 3 lbs 4 ounces.) In my opinion, with that grip, it would be agile and very fast! London (Wallace Collection): ? 60 (+12.7 missing), 4.8,?, ? As mentioned above, this sword is now a part of the Metropolitan Museum of Art collection. It is now viewable online. It was announced in their Art Bulletin in 2007 as a new acquisition. I recently shared this sword on the myArmoury.com Facebook page. I'm bumping it here in case newer myArmoury.com members haven't seen it. It's a beauty! This sword is an extremely well proportioned and elegant example of a type that was in use throughout Western Europe from the late fourteenth through the fifteenth century. 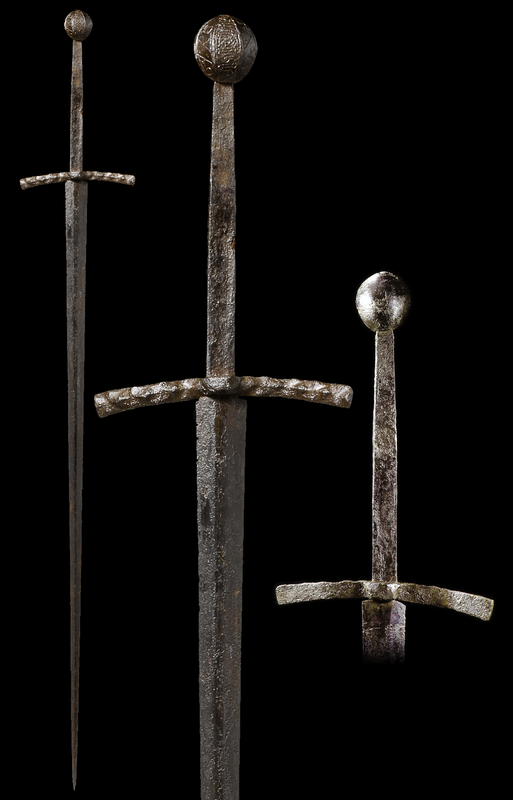 The steeply pointed blade, indicating that it was primarily intended for thrusting (rather than cutting), coupled with the stiffness of the blade, made it sturdy enough for its primary function, to pierce armor. The sword's form is further enhanced by the slight horizontal reverse curve and dimpled decoration of the cross guard and the faceted and engraved outer face of the pommel, which bears the word "MARIA," a pious invocation to the Virgin Mary. The spherical shape of the pommel and reverse curve of the cross guard are very unusual and distinctive features for a sword of this period with this type of blade. there was discussion of it having a fuller - well, it certainly doesn't have any of them on the blade, that's certainly a hex section. but it does look like the tang has a subtle hollowing or fuller on the decorated side, and plausibly on the other side too..
That's certainly an interesting observation! This is (most likely) simply an artifact of the forging process. What we call 'fish-lips'. hammering the edges of a hot bar cause the faces of the bar in contact with the hammer and the anvil to mushroom out & deform at a faster rate than the center of the bar...especially with a lighter hammer. It's very easy to 'fix', but unnecessary and/or even desirable on a tang.